Ludicrously exciting prospect, this: BioWare’s first brand new idea in a half-decade. 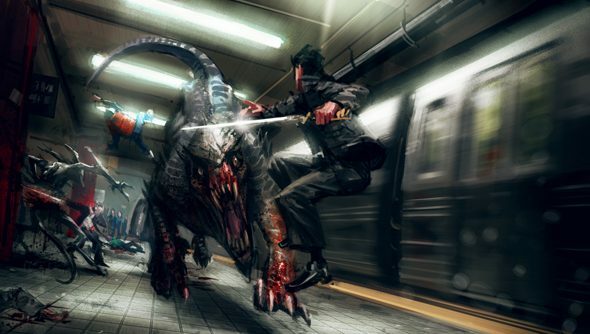 The new game is rumoured to be titled Shadow Realms, and was revealed last week via a brief live-action teaser trailer. We begin to see familiar themes emerging in this week’s clip: rings of fire, bad dreams and young men thrown from their everyday lives. The new trailer sees a chap in a cafe ignore repeated calls from an unlisted number, before forks of electricity ruin his meal and blow all the lights. Whether the explosions were caused by inherent powers beyond his ken or the sudden expiry of his contract with EE, it’s not clear. The whole affair is witnessed by a hooded figure outside. The call comes from California. Could that be our setting? ‘You’ve been chosen’ is the recurring phrase here. Whether you like it or not. Perhaps this is the new thing mentioned at E3: the “clean sheet” project in the works at BioWare Edmonton, the heart of the studio’s empire, where Dragon Age and Baldur’s Gate were born. Producer Casey Hudson said BioWare were interested in telling “contemporary stories” in their new game. It’s terribly exciting to consider we might get a modern day, real world RPG from developers who’ve always found it necessary to displace their social commentary into the realms of drow, dragons or drell. Don’t you think?